TUNE IT UP AND TURN IT LOOSE. The raw, high-stakes world of illegal street racing comes to life in Street Racing Syndicate. Trick out over 40 authentic licensed cars with parts fromover 15 real-world manufacturers, then turn your customized ride loose on the streets of three cities across the USA. Lay it all on the lineâ€”your wallet, your woman, your pride and your wheels. For the first time ever, throw down with opponents around the world via online pink slip races. With masses of perfectly tuned, nitrous-stoked horses under the hood, the only thing between you and victory is the distance from the pedal to the floor. 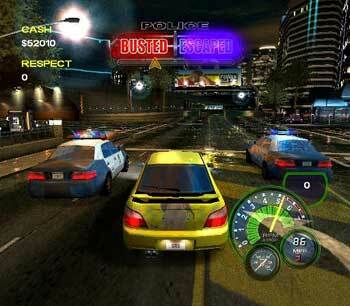 This game features an underground import racing scene, on which the player’s main objective is to gain respect and affection of various females in the city. This is featured in a way that the player must win a variety of respect challenges to attract girls and maintain a good victory streak in order to ensure that they remain with the player. Once in their car, the girls will present the next open race that the player enters. As the player continues to win races, dance videos will be unlocked for viewing. The game has 50 licensed cars from a variety of manufactures, including models from Toyota, Mitsubishi, Lexus, Subaru, and Volkswagen. SRS also features a car damage model that forces the player to drive carefully, heavy damages may impact car performance and heavy repairs may drain the player of money earned from their last race. May Run On Other Graphic Cards Too/Ofc. it works on latest ones.